What does it mean - I want life to be art? I'm sure it means different things for different people. 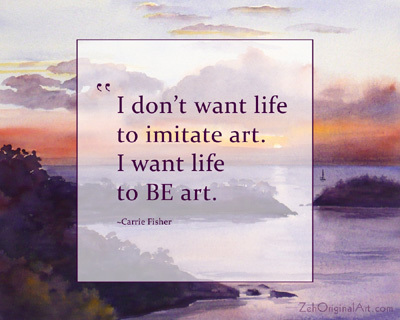 For me personally, it means that even when I am not painting, my life has to be deeply connected with doing something creative. Wow! what a great response to my request for photos to use as sample portraits! Thank you to all who sent in pictures of your children and grandchildren. I am hoping to begin work on the first one soon. This little jewel was fun to paint. I had originally painted the hummingbird as a 7x5 inch watercolor and the client requested an oil painting at the same size. This is a scene I painted before as a 16x20 inch oil. The client requested a watercolor 11x14. 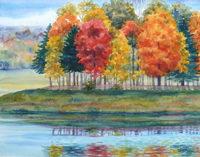 This is a companion piece to Fall Reflections. 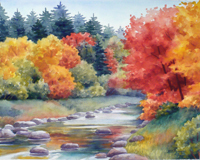 It is also an 11x14 inch watercolor and a scene I have painted several times. The two fall paintings go well together, don't you think? A person who likes to make things/do things/sing things/compose things/craft things/write things/dance things or who would do any of those if you could or if you had the time. It takes a L-o-o-n-g time to master any given art. You have to put “miles on your medium” as my friend, artist and author Jack White, would say. So let's take painting because that's what I mostly do. My students will come and tell me how amazing this or that painter is whom they saw demonstrate in a video or on TV. The painter merely takes the brush and flick! all of a sudden there is a tree or a line of trees, or an entire scene. Then the students try it and don't understand why it does not work for them. They think perhaps they just don't have the talent. I tell them not to be discouraged. Most likely, that artist spent years perfecting the technique. How will they replicate it in one or two tries? Claude Monet said to a student, “Paint the best way that you can as much as you can without being afraid to paint bad pictures…if your painting does not improve on its own… then there is nothing that can be done by me.” Notice he said to paint as much as you can! When I started painting watercolors, an artist told me that to master the medium, one must paint at least 1,000 watercolors. I did not like this idea. How was I ever going to paint that many? Some time later, another artist told me it would require 100 paintings. I liked this much better, so I aimed for 100 paintings. I could not wait to get to that magic number! And indeed, by 100 paintings, my work had improved. But 1,000 paintings later, I realized that the first artist was right. Art must be your life. I'm happy to take custom orders. Please contact me for a custom painting of your pet, home, garden, grandkids, favorite vacation spot or whatever your heart desires. To receive my posts by email, fill in your email address under FOLLOW BY EMAIL in the right hand column and click Submit. You'll receive my posts in your email inbox at the end of each day that a post is made.